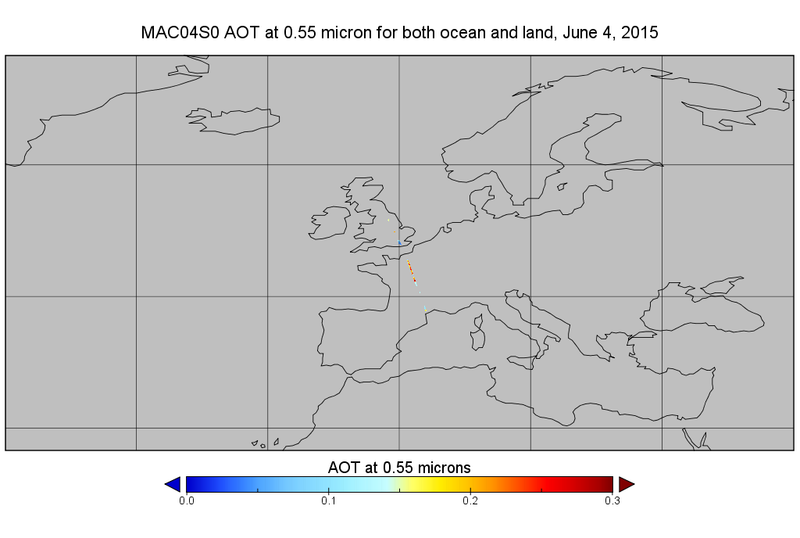 This is the narrow-swath MODIS/Aqua subset along CloudSat field of view track. The goal of the narrow-swath subset is to select and return MODIS data that are within +-5 km across the CloudSat track. I.e. the resultant MODIS subset swath is sought to be about 10 km cross-track.However, the original MYD04_L2 has 10-km pixels. Thus, MAC04S0 cross-track width is 2 pixels, the closest on either side of CloudSat track, and the resultant cross-track swath width is about 20 km.Along-track, all MODIS pixels from the original product are preserved. In the stardard product, the MODIS level-2 atmospheric aerosol product provides retrieved ambient aerosol optical properties (e.g., optical thickness and size distribution), mass concentration, look-up table derived reflected and transmitted fluxes, as well as quality assurance and other ancillary parameters, globally over ocean and near globally over land. (The shortname for this product is MAC04S0).